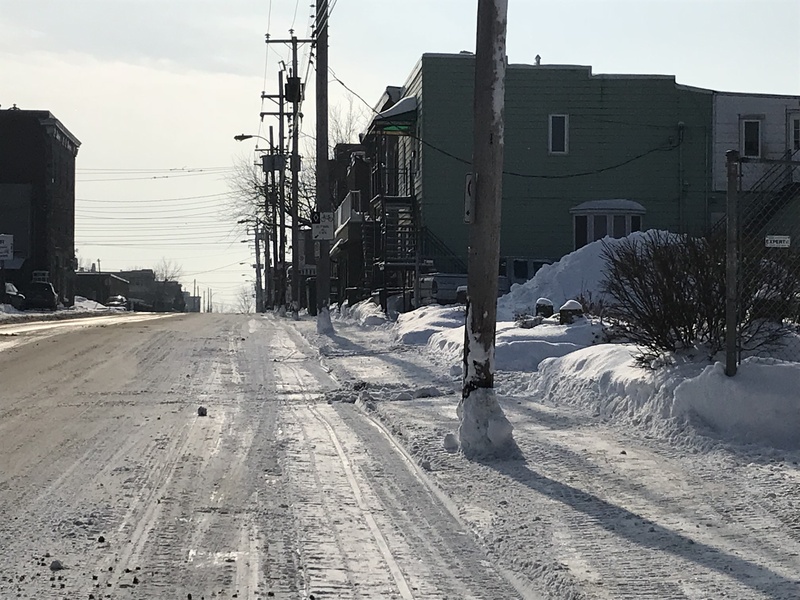 I was in Lachine for a meeting today and wanted to paint right after, but there was a “snow clearing operation underway”, as they like to say on the radio. That usually means that street parking is impossible and dozens of dump trucks are on the road, making sketching challenging for someone in their car. I took a quick phone photo and came back home to paint. Back in the studio I made a value study in pencil (and then accidentally dropped paint on it!) so that I could simplify the almost monochromatic scene. No detail in this, just the main shapes along with the lights and darks. You can tell I keep it close by to refer to because it has the same pigment on it as my painting. I painted using a limited palette today. This triad of primary colours is one I choose when I want to paint using a muted colour scheme: Cerulean Blue, Yellow Ochre and Organic Vermilion. The blue and the ochre are opaque pigments and can be used quite thickly, which contrasts well with the more transparent areas of the painting. I added a bit of Cobalt Blue for the snow, and some Neutral Tint when I needed to darken the colours. Painted on a quarter sheet of Arches 140 lb Cold press paper. You have such a great “gift” to be able to simplify and see beauty everywhere. Wonderfully executed! Far cry from Sanibel but boy can you do wires! Far cry for sure. Great to hear from you Angie. Hope you are enjoying the winter by being someplace warmer than Montreal. I always enjoy your posts and try to learn something from them (you), through observation and from the wonderful tips that you share. Today is extra bonus day, since you have included the value sketch, the type of paper, the size, and the colours. Thank you! Thanks so much Katerina. And now if you look down in the comments you will see my reference image too! Thank you Shari for posting the reference image! When I look at them side by side, the reference image and the painting, it makes a lot of sense, but looking at a scene or a picture and finding its potential is much more challenging. Your answer below, to Rita helps a lot too, what you look for and how you use those elements to create such interesting compositions. I’ll bet your painting makes the scene more picturesque than it appears in reality, Shari. Beautiful interpretation of an “ordinary” subject. When I am stuck as to how to paint a scene where nothing jumps out at me, I begin to think “what would Shari do?”. Rita, if you look in the comments you will see my reference image. That will give you an idea of a starting point. As for selecting a subject, what I look for is often a good contrast in values. For example, I won’t select a building just because it’s a famous building. Instead I will look for some interesting light and shadow on the side of the building, hopefully with a few trash cans or some interesting tidbits of things around. I look for elements that can be repeated to form an interesting pattern, or dark against light or the opposite. I am looking for a puzzle off interlocking shapes. Does that help? I know it sounds a bit vague. Brrr. I think I like the idea of snow more than its reality! 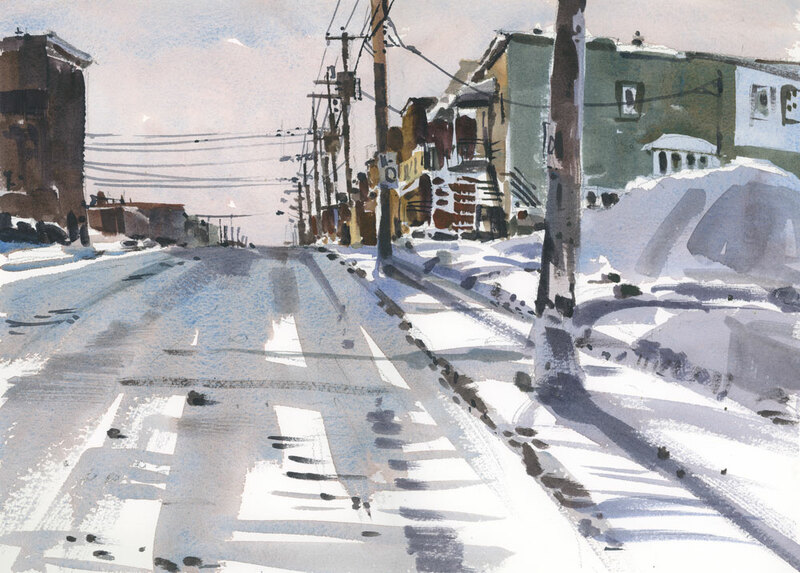 This is a great winter for snow painting because there’s lots of it but yes, winter is long. Not sure where you live but hopefully it’s warmer than here. Today it will be about 76F. Yesterday 80. Starting tomorrow a week of the 60s. I’m in California! I love seeing your processes! Would you mind showing the photo, too? It would be interesting to see how much stuff you simplified or left out, which is always a challenge for me. Since you asked, here is a link to the photo so you can see. It wasn’t a very interesting scene so I did simplify quite a bit, but I still wanted to maintain an almost monochromatic feel to it. Does that help? You always say you don’t do as well from a photo but now I don’t believe you. I would never have thought your painting was from a photo. And thanks for your explanation of how you progress in a painting using the lights/darks, and shadows, etc. . Another great idea for your next class or book. Ha. Since my back surgery, I am using photos more and more. I looked into this once and learned that many great painters also used photos–Degas, Van Gogh, for instance ,and many more. Judy, I can’t believe you remember that I said that. Yes, it’s true, I am often frustrated by working from photos. I feel the painting never has enough freshness. But since I renovated my studio this year, I love working in it and am having more success working with photos. Also, out of necessity this holiday, I worked inside because it was too cold to even paint in my car. So I think I can say that I am not hating working from photos as much as I used to. I think every Painter or sketcher should get hold of the book “Powerful watercolor landscapes” by Catherine Gill and Beth Means. It is possably one of the most helpful books around to help you see subjects like Shari does. It changed my whole way of sketching, painting in every medium. Its a “must have” and every library should have it along with “Making colors sing” by Jeanne Dobie. John, thanks so much for this. I have been meaning to buy this book for a long time, so this is a great reminder. I think I saw Catherine’s work for the first time in Tom Hoffmann’s book, but never got around to buying it. Jean Dobie’s book is another one that I have had in my library for years, but I have the old edition where she works with fugitive colours. It has since been updated to get rid of those. Another favourite in my library. “Getting hold” of this book was the hard part. Amazon and Barnes and Noble are out. I finally bought a used copy from Abe’s . Looking forward to it. Thank you, John. I always appreciate a good art book. I’ve had this book for a long time now and I use it as a design reference. That is what it was designed for, a go to work book. It is not a traditional “how to” watercolour book, although it uses Catherine Gill’s watercolour paintings as examples and covers her choice of pigments, some colour mixes and some other watercolour basics. It is a book that explains the Elements and Principles of Design in a easy to digest manner, building from your initial “what” (focal point), to the importance of value sketches, shapes, value dominance, picking the hues for your painting (limited palette), etc. 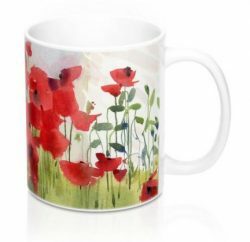 It has everything one needs in order to design a painting, independent from the medium to be used. Every page has important little pieces of information. It is simple and easy to read but when I tried to create a master “check list” from all the different topics, i realised how complicated it really is. As far as availability, I just checked on her website and it looks like the book is available there, though I am not 100% sure. Jeanne Dobie still loves and uses the Rose madder Genuine but in her palette update informs us that this color “can remain durable IF your painting is framed properly with UV protected glass and not placed near a window or direct sunlight”. All your paintings have the emotional quality that stired you to want to paint them and are not just “pretty pictures” another lesson I took from Catherines book and variefied by your work. I love seeing the photo, the value study and then what you created as an actual painting. I keep studying your color choices for your snow paintings hoping I’ll be able to use your color combinations. You did a great job on this! !